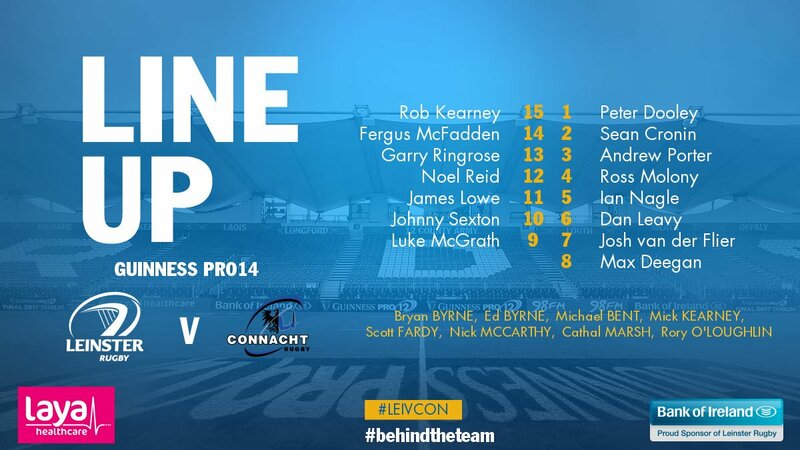 What I like most about this first Leinster starting lineup of 2018 is the presence of Dan Leavy. He was in full beast mode in Thomond Park and deservedly took the man of the match award as well as a host of accolades which included comparisons to Richie McCaw. Since Leinster have what I call a 'one-arm bandit' of back row talent in that any combination of three could easily lead us to a jackpot, giving him a well-earned rest wouldn't affect our chances too badly. Yet here he is, starting yet again, pretty much dared to back up last Tuesday's display with a show of consistency, on the opposite side of the scrum into the bargain. And in many ways that is a challenge which is put before the Leinster team as a whole, not just for today, but for the rest of the campaign. This season so far has been a major success for us...yes, there were a couple of disappointments in Bloemfontein and Glasgow but it's hard to dwell on them when we have a perfect record in Europe plus home and way wins over quality teams like Munster and Exeter. But last season we were putting in equally impressive results by the time the tournament semifinals rolled around only to fall short, so we need to leave our self-back-patting behind us in 2017 and concentrate on the road ahead. Also, one of the teams that caused that disappointment, the Scarlets, stand in our way in Conference B and won yet again yesterday to help us keep focused. 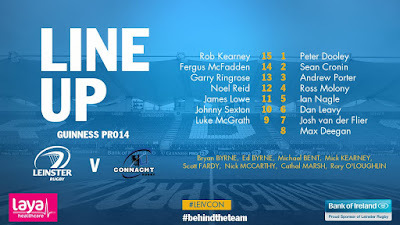 Then we have our opposition today - Connacht arrive in Dublin with oodles of confidence and motivation themselves. They aren't completely out of the Pro 14 playoff picture, they have Champions Cup qualification in their sights on two fronts, their tails are up after a big pre-Christmas win over Ulster, they enjoyed a longer turnaround than we did since the previous round and last but certainly not least, they are absolutely gagging for a win at our place. We should be tested to the full today. Where we'll need the big performances is the forwards. Although Leavy is there along with another recent rising star in Josh van der Flier, as a starting unit it is one of the 'weaker' packs we have named in recent times and it's up to the individuals involved to force those words back down my throat. And should they come to grips with their opposition and provide plenty of possession, we certainly have a back line that can do some serious damage. I'll be looking for Luke McGrath in particular to shine today. With the Six Nations looming it's a good chance for him to show how well he can combine with Johnny Sexton and what's more, his principal rival for the Irish 21 jumper is lining up against him...should be quite the battle. The bookies have us winning by 13 - personally I reckon Kieran Keane's men are going to have to leave their form back in Galway for a margin like that to happen. Hopefully we'll have enough to stay ahead of them but my prediction is that they'll only be within 4-6 points of us by the end. Whether we'll get enough tries to gain some more ground on the Scarlets remains to be seen, though it's possible Connacht could open things up to give us a few chances. Replacements : Shane Delahunt, Peter McCabe, Conor Carey, Quinn Roux, Naulia Dawai, Caolin Blade, Eoin Griffin, Niyi Adeolokun.